Out is the first maintenance update for SketchUp 8, as announced by The Official SketchUp Blog. The big news is they fixed a projected shadow bug, a problem in the shadow calculating algorithm, that went unsolved for several versions. Watch this good-humoured video made by the SketchUp team showing the issue, now fixed. As one can see, when the camera passed under some shadows, other shadows would be displayed wrong, the full explanation from John Bacus, SketchUp Product Manager. 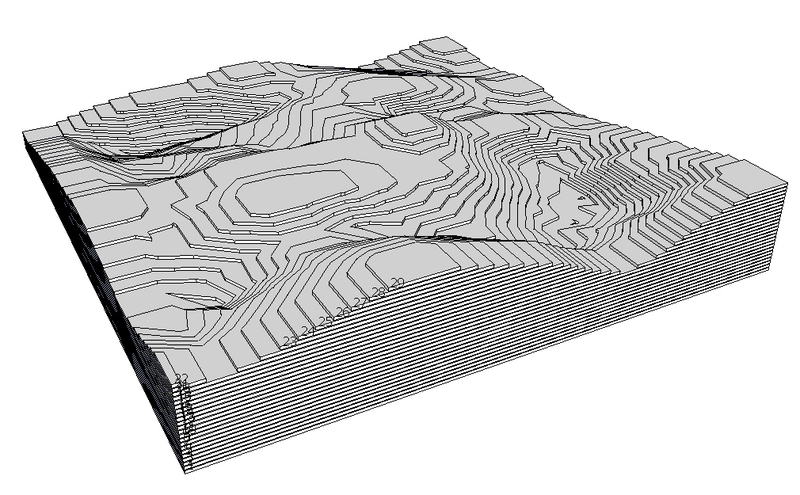 Slicer plugin will help you produce a physical model from a 3D terrain surface, it can slice a SketchUp component, distribute and number the pieces for an easy assembly. You can imagine what this plugin and a laser cutting machine might achieve! Render[in] is the first SketchUp render plugin with real-time preview. Its first official version (v1) came out last December 31st. The interface looks very simple and well designed. In almost no time one can create interesting images, with many kinds of lights, auto-bump textures, an infinite ground-plane and some automatically generated clouds. There are also radiosity settings to choose from. SB2, makers of Render[in], are a part of Abvent group, developers of Artlantis, a very popular rendering software for architecture and design, so we belive this is likely to become a popular render for the SketchUp platform too. 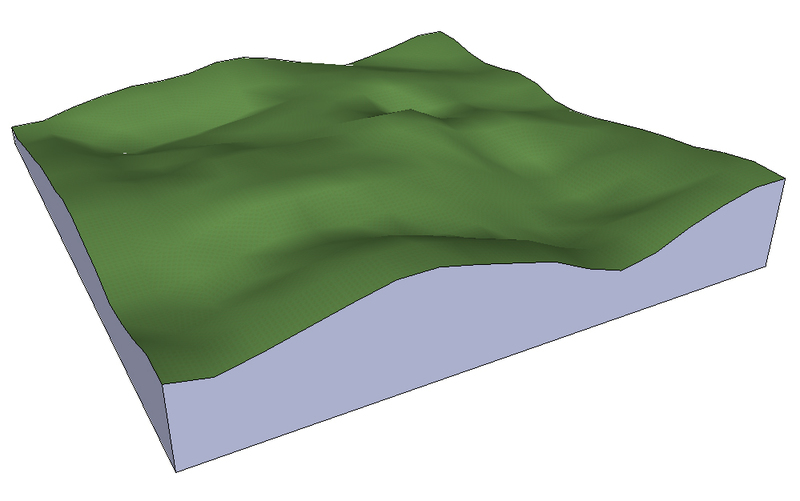 You can download a 30-day trial that works on SketchUp 7 and 8, Windows or Mac OS, at http://www.renderin.com. Create a free account under “Member Area” to get access to the download links. The plugin can be bought directly from the site using PayPal or a credit card, it costs US$160,00. An excellent cost-benefit when compared to SU Podium (US$180,00) or V-Ray (US$800,00). How about sleeping in a bed like this? seems a bit uncomfortable, doesn’t it ? 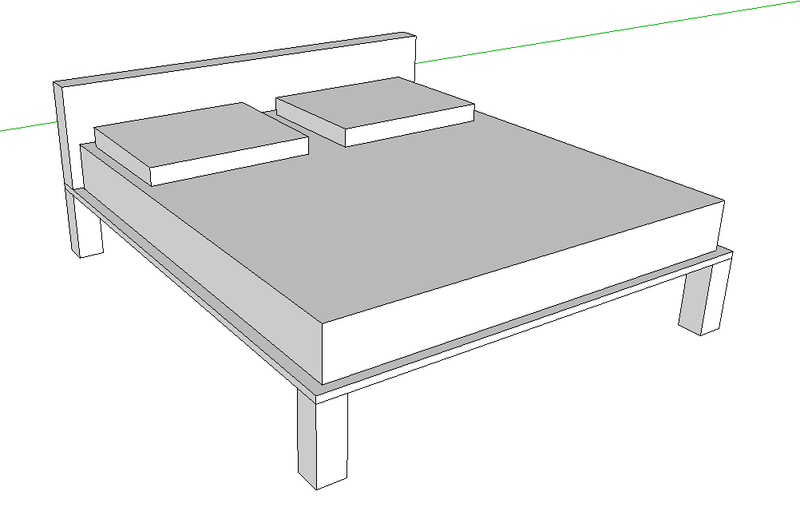 With the Soften/Smooth Edges SketchUp command it can get a bit better, but sometimes it’s not enough. The Round Corner plugin can fillet at once many edges, giving a much better look. Once again Fredo saves the day. Ruby is the programming language that can be used to extend SketchUp capabilities. SCF Toolbars are plugin sets developed along the years by many Ruby programmers and conveniently arranged on toolbars for easy access by Qarr-it. We specially recommend the SFC Powertoolbar, which contains mirror, pipe along path, multiple push-pull , selection options among other plugins. Find the “secret” SketchUp 6 libraries! Snapshot of the SketchUp 4 site, before it was acquired by Google. Prettier than the current incarnation, IMHO. Not everyone knows SketchUp was created by a company named AtLast Software and launched in 2000. Only in 2006 did Google buy AtLast and consequently SketchUp. In those years AtLast team created a great component library for SketchUp, those objects would be copied locally as you installed the application (versions 4 and 5). From version 6 onwards those libraries were available as “Bonus Packs” at the site. As Google 3D Warehouse was launched, it seems those libraries were left aside – the 3D Warehouse offerings were so numerous. But we all know it can be hard to find well-modeled and “light” components, that’s why the old libraries (we could argue, somewhat hidden by Google) are so useful! Well, here you have a link for you to find those objects, they work with SketchUp versions 6, 7 and 8. Have fun! A good tip for Interior Designers, or to anyone planning a bedroom makeover, is to download Sherwin-Williams color palettes from Google 3D Warehouse. They come as SketchUp files and are divided into sets. 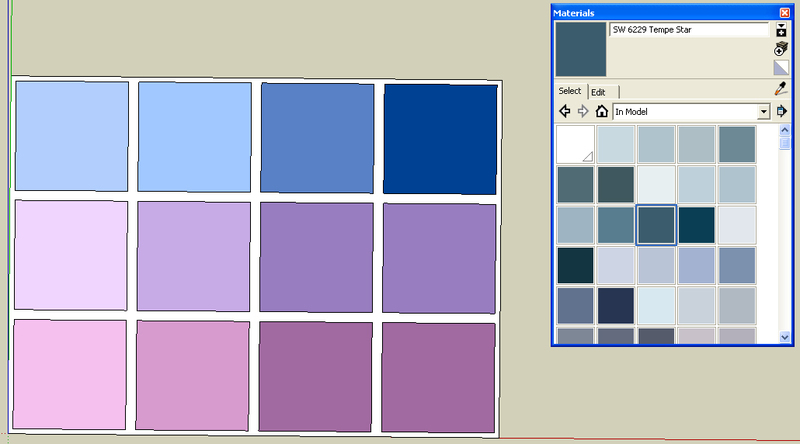 As you open the file you will see just 12 swatches, but clicking at the “in Model” house icon, at the Materials window, will show you the full palette sporting the Sherwin-Williams color codes. Very handy! 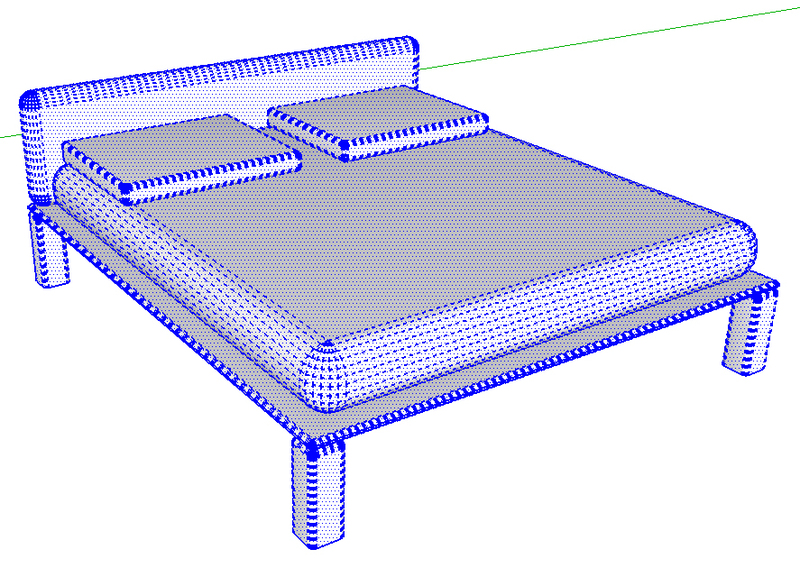 Joint Push Pull is an easy to use plug-in that might come in handy to most SketchUp users. Who never wished to extrude more than a single face at once? Joint Push Pull will do it, and more! The plugin can extrude several faces at once, it accepts curved faces, automatically makes a group from your extrusion, extrudes on any direction and even has its own undo button that works independently from other SketchUp actions. Create by Fredo, of Fredoscale fame, this is yet another plugin deserving some space in your toolbars. To download, you must register at http://www.sketchucation.com. The download link is http://forums.sketchucation.com/viewtopic.php?f=180&t=6708. Why SketchUp, versions 8 and 2013, won’t have 3D Warehouse direct access anymore? SketchUp Pro 2014 – New Features!